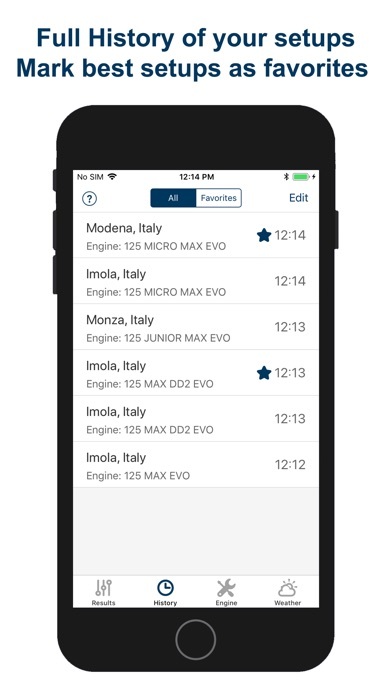 This app provides, using weather conditions and your engine configuration, a recommendation about jetting and spark plug to use for karts with Rotax 125 Max EVO (Micro Max Evo, Mini Max Evo, Junior Max Evo, Max Evo, Max DD2 Evo) engines, which use a Dellorto VHSB 34 XS carb. 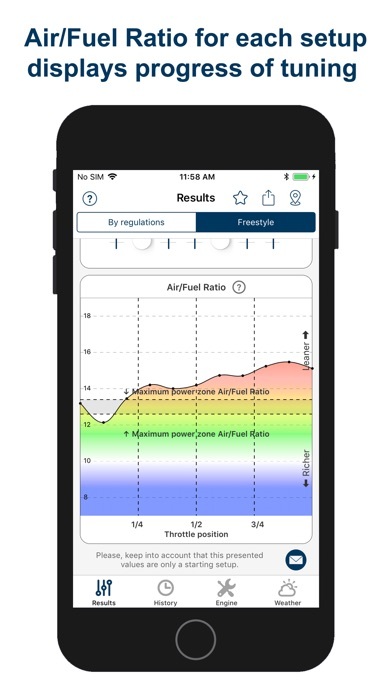 This app can obtain automatically the position and altitude to get the temperature, pressure and humidity from the nearest weather station thought internet. Internal barometer is used on supported devices for better precision. If more accuracy is needed, a portable weather station can also be used. • Two different tuning modes: "By regulations" and "Freestyle"! 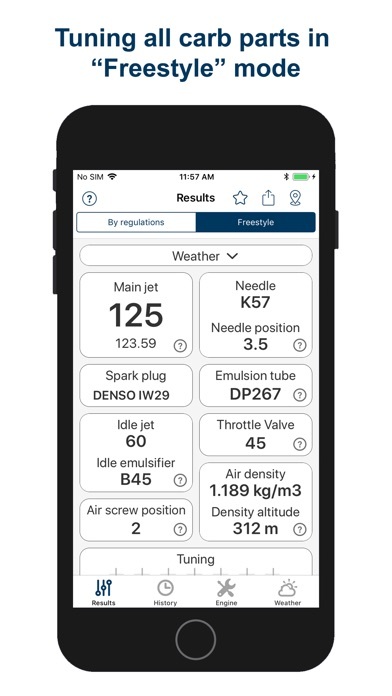 • In first mode, the following values are given: main jet, spark plug, needle type and position (including intermediate positions with washer), air screw position • In second mode (Freestyle), the following values are given: main jet, spark plug, emulsion tube, needle, needle type and position (including intermediate positions with washer), throttle valve, idle jet (outer pilot jet), idle emulsifier (inner pilot jet), air screw position • Fine tuning for all these values • History of all your jetting setups • Graphic display of fuel mix quality (Air/Flow Ratio or Lambda) • Selectable fuel octane • Adjustable fuel/oil ratio • Adjustable floats height • Mix wizard to get the perfect mix ratio (fuel calculator) • Carburetor ice warning • Supports international configuration • Possibility of use automatic weather data or a portable weather station. • let you use different measure units: ºC y ºF for temperatures, meter and feet for altitude, liters, ml, gallons, oz for fuel, and mb, hPa, mmHg, inHg atm for pressures. The application contains four tabs, which are described next: • Results: In this tab two jetting setups are shown. These data are calculated depending on the weather conditions and the engine and track configuration given in the next tabs. 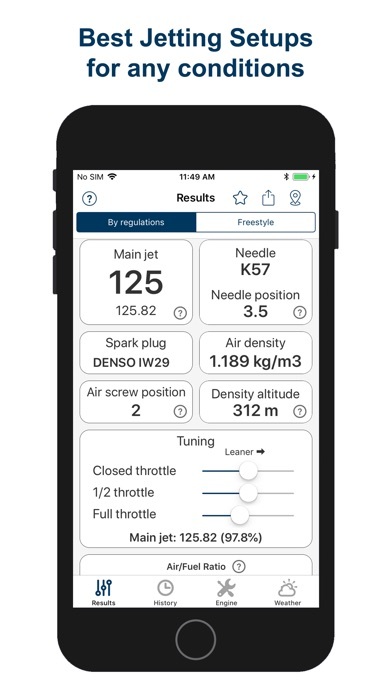 First setup (by regulations) - includes setting only those parameters of the carburetor, which are allowed by the regulations of official competitions: main jet, needle position, spark plug and air screw position. Second setup (freestyle) - includes setting all the parameters of the carburetor: main jet, emulsion tube, needle type and needle position, inner pilot jet and outer pilot jet, throttle valve, air screw position. This tab lets do a fine tuning adjustment for all this values for each jetting setup to adapt to the concrete engine. Besides this jetting information, the air density, density altitude are shown too. You can also see in a graphic form the calculated ratio of air and fuel (lambda). • History: This tab contains the history of all jetting setups. If you change the weather, or engine setup, or fine tuning, the new setup will be saved in history. This tab also contains your favorite settings. • Engine: You can configure in this screen the information about the engine, that is, engine model, float type and height, fuel type, oil mix ratio and type of the circuit. Depending of this parameters, the jetting setups will be adapted. 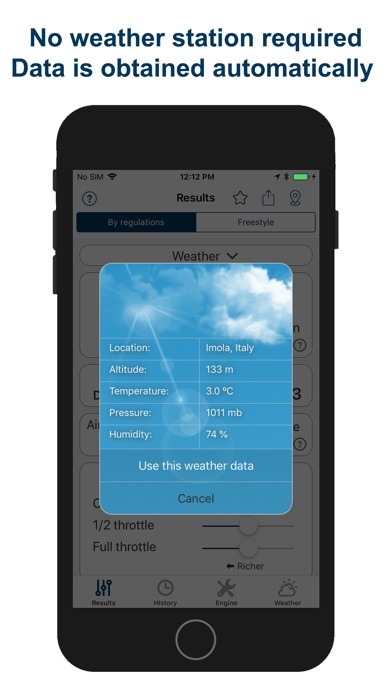 • Weather: In this tab, you can set the values for current temperature, pressure, altitude and humidity. 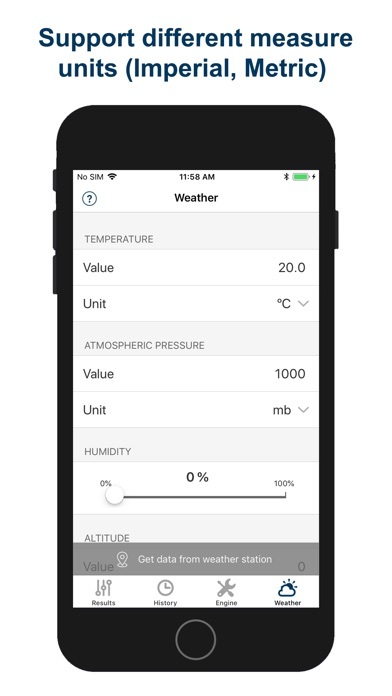 Also this tab allows to use the GPS to get the current position and altitude, and connect to an external service (you can choose one weather data source from several possible) to get the weather conditions of the nearest weather station (temperature, pressure and humidity). In addition, this application can work with a pressure sensor built into the iPhone. You can see if it is available on your device and turn it on or off. Also, on this tab, you can enable alerts about possible carburetor icing. 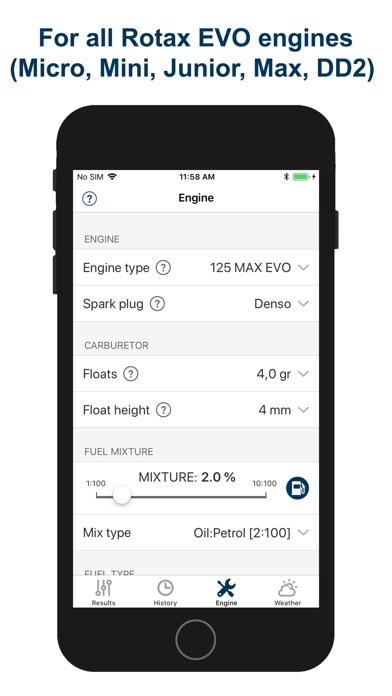 For Rotax Max non-EVO Engine please try our other app: Jetting Rotax Max Kart. If you have any doubt about using this App, please, contact us. We answer every question, and we take care of all comments from our users to try to improve our software. We are also users of this application. Easy to use and very valuable information. Simple and save a lot of time for me. Power feels great with base setups for my weather and location. Senior class. Compared it with Jet-Tech Pro software and it’s spot on. So! It’s a big deal! Super app!